This'll be the last day that I'll be posting anything that's connected with the Fantastic Four or any hero for that matter, I'm a little bit tired of drawing so many supers in a span of one week (two weeks if you count the first week of my dailyetal). So umm, I don't have any idea on what theme to work on next week (that's already tomorrow, damn) anybody got an idea? The Fantastic Four is a fictional superhero team appearing in comic books published by Marvel Comics. The group debuted in The Fantastic Four #1 (cover-dated Nov. 1961), which helped to usher in a new level of realism in the medium. The Fantastic Four was the first superhero team created by writer-editor Stan Lee and artist and co-plotter Jack Kirby, who developed a collaborative approach to creating comics with this title that they would use from then on. As the first superhero team title produced by Marvel Comics, it formed a cornerstone of the company's 1960s rise from a small division of a publishing company to a pop-culture conglomerate. The title would go on to showcase the talents of comics creators such as Roy Thomas, John Byrne, Steve Englehart, Walt Simonson, John Buscema, George Pérez and Tom DeFalco, and is one of several Marvel titles originating in the Silver Age of Comic Books that is still in publication today. The four individuals traditionally associated with the Fantastic Four, who gainedsuperpowers after exposure to cosmic rays during a scientific mission to outer space, are: Mister Fantastic (Reed Richards), a scientific genius and the leader of the group, who can stretch his body into incredible lengths and shapes; the Invisible Woman(Susan "Sue" Storm), who eventually married Reed, who can render herself invisible and later project powerful force fields; the Human Torch (Johnny Storm), Sue's younger brother, who can generate flames, surround himself with them and fly; and the monstrous Thing (Ben Grimm), their grumpy but benevolent friend, a former college football star and Reed's college roommate as well as a good pilot, who possesses superhuman strength and endurance due to the nature of his stone-like flesh. 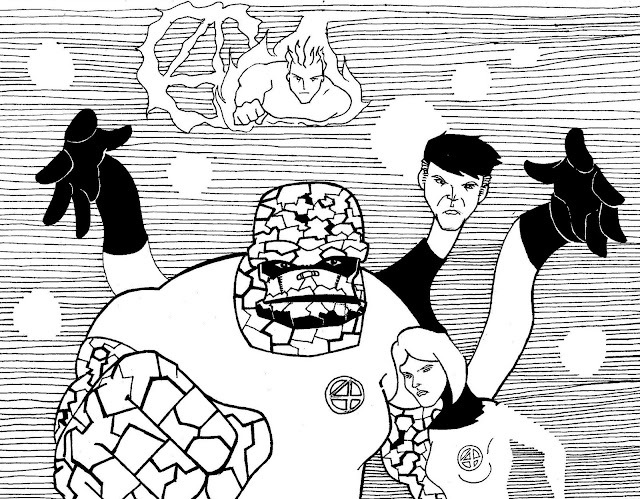 Ever since the original 1961 introduction, the Fantastic Four have been portrayed as a somewhat dysfunctional, yet loving, family. Breaking convention with other comic-book archetypes of the time, they would squabble and hold grudges both deep and petty, and eschewed anonymity or secret identities in favor of celebrity status. The team is also well known for its recurring encounters with characters such as the villainous monarch Doctor Doom, the planet-devouring Galactus, the sea-dwelling prince Namor, the spacefaring Silver Surfer, and the shape-changing alien Skrulls.